Being a customer oriented enterprise, we are engaged in providing a wide array of Medium Duty Lathe Machine. Power plus brand portable auto welding lathe/ welding positioner with 90 degrees tilt, This machine can be used as a welding lathe and also welding positioner the dc drive witrh variable speed drive to suit your jobs uo to 100 kgs capacity. 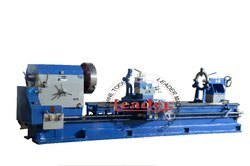 Lathe machine precision model 4.1/2' total bed length , Centre ht 6.5", bed width 9", spindle bore 40mm, one V belt drive . Price is without chuck, motor and switch without instalation and demo & taxes. 12feet ball bearing model with chuck.